'A Stockton artist, who is now enjoying success through her new freelance graphic design business, has taken her love for her hometown and turned it into vintage style prints now on sale at a local independent bookshop. 24-year old Abby Taylor, a graphic design graduate from Cleveland College of Art and Design (CCAD), began working as a graphic designer in 2015 after gaining a first class degree at the university-level campus in Hartlepool, alongside working on freelance projects to develop her portfolio and client base and challenge her creativity. After winning an art competition in Hartlepool in 2017 to create large-scale posters for the railway station with her partner Owen Smith, and receiving a further commission by Hartlepool Council, the success gave Abby the encouragement she needed to leave a job that was no longer fulfilling or challenging her, and go self-employed. Over the past year, Abby has built up her graphic design and illustration business and is now taking commissions from local business and organisations across the Tees Valley, with clients including Tees Music Alliance, CCAD and the National Museum for the Royal Navy. 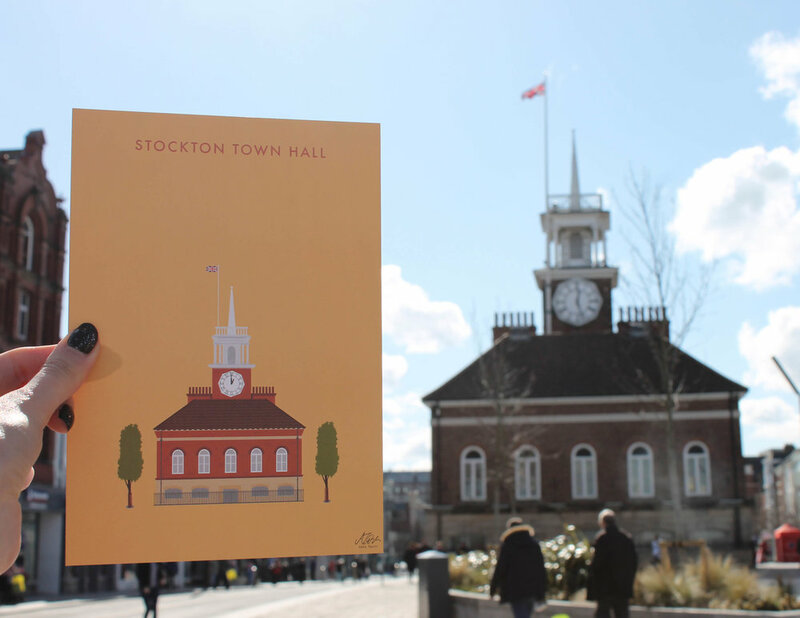 Following the success of the railway artworks featuring local Hartlepool landmarks in a nostalgic 50s style, the talented young artist took the concept and her fondness for Stockton to create images of its iconic town hall and high street. Abby explained: “Stockton is where I grew up and where I currently live so it holds a lot of dear memories for me. I was determined to pay my beloved town homage and decided to create an exclusive print, working with the same style of illustration that I have used for other clients, including Cleveland College of Art and Design and Hartlepool Council." “Drake, a local independent bookshop, struck me as the ideal home for my prints. Having recently won The British Book Awards’ Independent Bookshop of the Year in the North category, Drake has a fantastic reputation and is a place I often visit. Throughout the year they hold author events, book clubs and activities to get children and adults excited about reading. It was the sense of community for bookworms that drew me in, and confirmed for me as the right place for my prints. 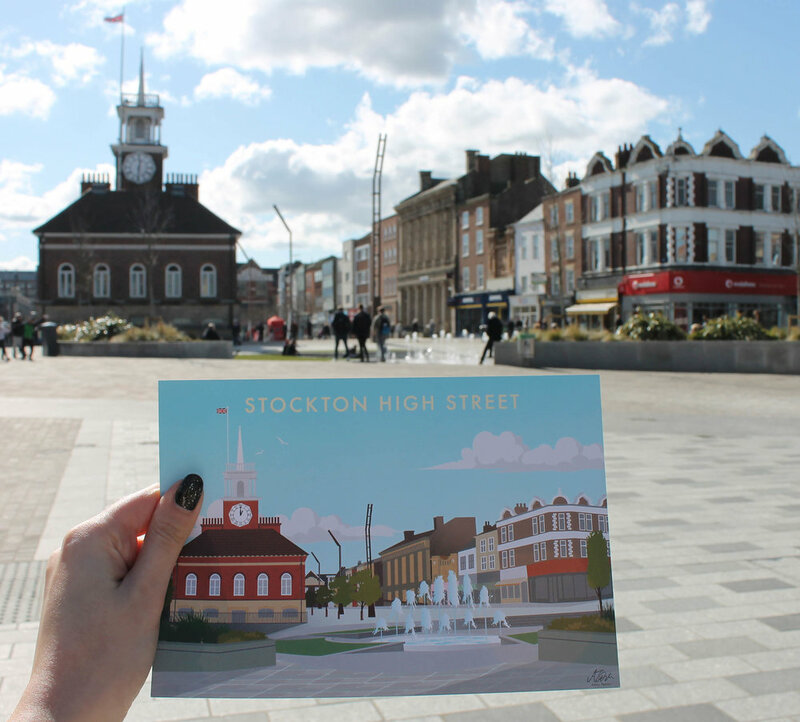 This is the first artwork to be sold at Drake and Abby has created the Stockton High Street illustration – available in both A4 and A5 – in her trademark vintage style. Abby has also created illustrations of CCAD’s campus buildings, including the new multi-million teaching facility, 1 Church Street, the existing teaching facilities in Church Square, and the former Post Office building in Whitby Street, which is undergoing a transformation into a studio and business centre for people working in the creative sector. The images from 1 Church Street are currently being used in a promotional campaign by the specialist art and design school across the UK to potential students. This article or snippets of it have been in The Northern Echo, CCAD's Website and NEConnected. First photo and copy by Kathryn Clapham at Elevation Marketing. There has also been an influx of interest in businesses wanting their own illustration of their place of work for decorative and promotional uses, or even to use on their own merchandise! If you would like to inquire about commissioning a bespoke illustration of your building or place of work, please email hello@iamabbytaylor.com or fill in the contact form on the Contact page.